I love when new stamping plates come out! Even if I don't need them! Stamping allows me to create so many designs that I would never be able to freehand. This means that I am always looking for new designs or designs I have been thinking about doing. Recently Bundle Monster released a new 10-piece set and I couldn't wait to get my hands on it! Bonus, why not test out their stamping polish?!? Here is this Sun Kissed Collection and the Creative Art Polish Collection in cream. Of course you can tell in the photo that I used many plates to create my underwater design. To create this look I used images from plates 501, 504, 506, 509 and 510, plus each stamping polish. I had absolutely no trouble using either the plates or the polish. All of the images were cut perfectly allowing for easy image transfer. Each nail polish was the perfect consistency to capture each image. The proof is in the design! I have clean, crisp images on each nail! Yes the mermaid does has some bald spots, but that is from the scraping. If I had scraped in a different angle that would not have happened. I am very impressed with these plates and stamping polish. The images are fantastic and the polish worked wonderfully! Of course I should really try the polish over black to see the results. I guess I'll just have to create another design! 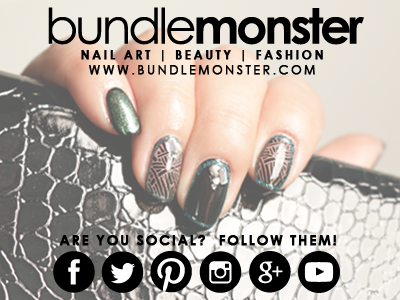 The Sun Kissed Set, $9.99, and the Creative Art Polish, $12.99, can be purchased directly through bundlemonster.com. Lovely collection this one is! So perfect for beach nails. It's great that these stamps have so many options that you could create all different designs on your nails that are cohesive! Fabulous! Love the layers! But I really love the octopus!